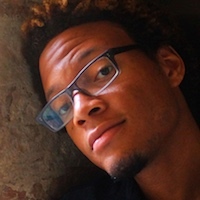 Rickey Laurentiis’s debut collection of poetry, Boy with Thorn (University of Pittsburgh Press, 2015), won the Cave Canem Poetry Prize and the Levis Reading Prize, and was a finalist for the Kate Tufts Discovery Award. Individual poems have appeared in Boston Review, Feminist Studies, Kenyon Review, the Los Angeles Review of Books, New Republic, the New York Times, and Poetry, and have been anthologized in Extraordinary Rendition: (American) Writers Speak of Palestine, Bettering American Poetry, and A Tale of Two Americas: Stories of Inequality in a Divided Nation. He is the inaugural Fellow in Creative Writing at the Center for African American Poetry and Poetics at the University of Pittsburgh.